Exciting phonics-based stories in Biff, Chip and Kipper Stories: Decode and Develop are perfect for embedding and building on children's phonics knowledge. 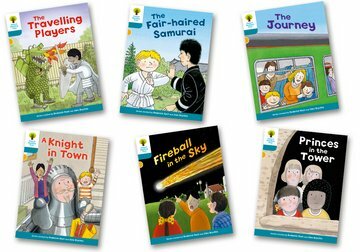 This pack contains 6 books, one of each of: The Fair-haired Samurai, Princes in the Tower, The Journey, Fireball in the Sky, The Travelling Players, A Knight in Town. New adventures featuring well-loved characters. Phonics-based stories with high-interest vocabulary to support language development beyond Phase 5 of Letters and Sounds. Inside cover notes to help adults read and explore the story with the child, supporting their decoding and language comprehension development. Parental support, from inside cover notes to online advice, tips and activities on Oxford Owl.